Why are successfull tests in Travis displayed in red? That's a great question :) Definitely a bug we need to look into, even if it's just occurring on Travis. I see the same issue with Concourse CI. I think this is due to the use of colors which require a 256 color terminal. Could inspec be changed to use only basic colors? correction.. in Jenkins, a fix was to upgrade the 'AnsiColor' Plugin to 0.5.2. I'll send a PR to change it to regular green if it will be accepted. I have this problem in CircleCI as well (their default TERM setting is 'dumb', but did try forcing it to xterm). If I run the same job in Circle via ssh, my term gets set to xterm-xfree86 and it displays just fine. @mmb did you ever submit that PR? I think the regular green actually is easier on the eyes anyway. Seems like this is the section. What do folks think makes the most sense? key on TERM=dumb as well as the platform selector? Or maybe switch to 'color' or something similar, rather than using escape codes directly? Note: InSpec v1 is generally not receiving noncritical updates at this point. 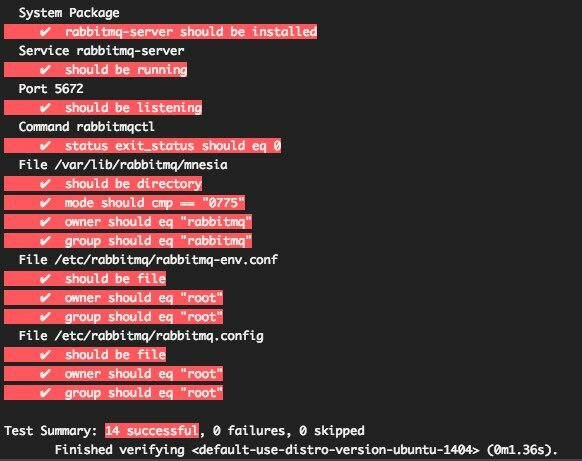 On InSpec v3 / master, the color codes are located in https://github.com/inspec/inspec/blob/master/lib/inspec/reporters/cli.rb . @clintoncwolfe Phew, thanks for pointing that out [that was actually the one I was editing in my branch]..
but I feel like the cleanest fix would be to look for explicit TERM settings likely to have 256 colors and / or the setting of $COLORTERM, and default to standard colors otherwise? @wyardley @clintoncwolfe I am looking in to a similar issue - we use Rundeck for our automation and it attempts to render the ANSI colours in the log output. The problem is that it can handle basic ANSI colours but the extended colours do not look great - red looks pink for example - and it cannot display the Groovy UTF-8 characters (to quote the source code) which end up just looking bad in the output. I thought of adding an additional reporter, something like cli-safe which just uses the basic colours and boring indicators. This would mean duplicating the cli reporter, removing some code, and then duplicating the cli tests. This does not sound like a great solution to me because it would also mean always having to update cli and cli-safe when making any changes or fixes. Your suggestion of adding a check for ENV['TERM'] == 'dumb' would work for Rundeck but I'm not sure checking $COLORTERM would help since I can see it is not set when Rundeck executes. I am keen to fix the issue but wanted to know your thoughts on the best way forward? $COLORTERM would not be set, which is the point, but it doesn’t seem to be universally implemented among terminals that do use extended colors. Having another flag (—basic-color? Or —extended-color with basic the default) might make the most sense? I think the current approach is maybe a little too magical for not much benefit, but I don’t know if there would be buy-in to simply getting rid of the fancier colors entirely. I think the flag idea may be a good solution. I would suggest --basic-color with the current behaviour of attempting to use extended colours being the default to avoid breaking the behaviour unexpectedly. We currently have --color and -no-color, a pair of boolean options. We could make --color take argument, default :fancy (or something). We could then accept --color basic, and if --no-color is seen, set color to 'none'. Thoughts? @clintoncwolfe that sounds great to me! I guess the other question would be whether dumbing down the UTF-8 symbols (as was done in the current test reporter) in certain cases should be tied to that option, or a separate option? Most CI systems have no problem showing the UTF-8 so there may be fewer users who want to disable them. @mmb yes, that’s true. But the current test output formatter makes both changes on Windows (hard-coded), so thought maybe they caused an issue there? @clintoncwolfe I support the idea of having --color basic.